The Ohaus C305-S Portable Plus is designed for all small weighing applications. It offers a maximum capacity of 300 g with 0.1 g readability. This single pan digital balance provides you with two weighing modes: grams and ounces. 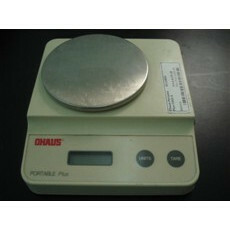 Below you will find auctions and classified ads for Ohaus lab balances and scales. Choose from a selection of vendors offering these items for sale and contact them to request a price quote. Ohaus, headquartered in Parsippany, NJ is a leading manufacturer of laboratory balances that offers a wide range of applications. LAB EQUIPMENT OHAUS-HARVARD trip balance S/N: 20775, 2KG-5LB (h440-31-87. LAB EQUIPMENT Ohaus explorer, balance max 110G, serial: G0951121110439, item: E01140, temp 10C/30C.